No matter the size or scale of your business, if you work with or produce volatile and flammable compounds, materials, chemicals, gases or vapors, you are required by federal and local regulations to protect against the possibility of ignitions, fires and explosions. Whether it’s a small car painting business or a full scale petrochemical processing plant, the dangers are the same; flammable compounds, particularly gases and vapors, hold the potential to create intense explosions and fires that can easily result in major damages, serious injuries, and fatalities. There are all too many well recorded incidents where something as simple and innocuous appearing as a backyard auto painting operation turned into a serious accident, simply because the operators did not adhere to the most basic rules of safety when working with flammable materials. On a larger scale, it is a simple matter to peruse a few headlines and find several examples where not only were major explosions and damages to commercial operations took place, but damages and deaths involving unrelated properties and civilians outside the actual work area as well. Preventing the occurrence of such incidents is a comprehensive endeavor requiring a multi-faceted approach. Anyone involved in the handling of hazardous compounds or who works within an environment where they are present must be properly trained and aware of the dangers they pose. The correct procedures relevant to each particular type of material must be instituted and followed, and the proper equipment provided and maintained. Although this would seem fairly straightforward at face value, the truth is that protection against the dangers of hazardous locations can become quite involved and complex. For each type of hazardous material there are different properties and levels of danger. Likewise, different levels of exposure and the frequency of that exposure add yet another level of complexity. Simplifying protection in the hazardous workplace is in large part a matter of having the right equipment and maintaining such equipment at its peak performance. With explosive of flammable compounds, the Fire Triangle is commonly referenced since it defines the most basic requirements for a fire to exist. The principles of the Fire Triangle tell us a fire can only exist if three sides of the triangle are present and in the proper amounts. This triangle represents Heat, Fuel, and Oxygen, and when all three are present in a location, the potential for fire or explosion is high. In the simplest terms, removing one part of the triangle will thus remove much of the explosion or fire potential. With hazardous locations, it is rarely easy or practical to remove either oxygen or fuel. This is because it is nearly impossible to operate an oxygen free environment, and the flammable compounds that are present are usually a part of the industrial process. Thus, removing heat, or rather the source of ignition, becomes the primary target for practicing prevention. Indeed, when incidents arise, it is often determined that “inadvertent ignition” had taken place. So, it is then important to identify and understand what represents the heat or ignition source in order to remove it from the Fire Triangle. The most direct source of ignition in hazardous locations is represented by electrical equipment. Switches, motors, lights, fans, anything that operates with electricity is a potential source of heat, sparks or flame. In order to remove the potential for ignition these sources of sparks , heat or flame represent, it is then necessary that such equipment be designed so that the ignition source has limited or no interaction with the hazardous environment. This is accomplished through two main approaches; specially designed equipment housings that either seal out the outside environment or contain passages that slow the escape of ignited materials enough to cool them before exiting the housing, or designing such equipment to operate at voltages too low to produce heat or sparks. The former is considered explosion proof and represents the bulk of hazardous location electrical equipment, and the latter is less common and generally more specialized in nature. Regardless of how equipment provides protection, the basic premise is the same; remove the source of ignition and you remove the potential for fire or explosion. While with many electrical devices it is a simple matter to seal or encase electrical connections, which effectively removes the potential for ignition, some equipment such as lighting presents special challenges. The biggest problem lighting presents is not sparks, but the heat created by filaments or heated gases within the glass bulb. Incandescent, fluorescent and HID lighting systems all essentially burn a material to produce light, which is simply another form of flame. What this means is that a light represents little more than a flame separated from a flammable atmosphere by nothing more than a fragile glass enclosure. Should this fragile glass enclosure burst or shatter, then intensely hot materials are directly exposed to the highly flammable atmosphere and a fire or explosion is almost certain. In the industrial workplace, the shattering of lamps is not only possible, but a likely eventuality. Explosion proof lighting prevents such exposure by encasing not only the electrical components within a sealed chamber, but the lamps themselves as well. Should flammable vapors or gases enter the fixture and damage to the bulb occur, the hot filaments and gases remain encased with the protective enclosure which slows their exit enough to reduce temperatures below the ignition point before they can escape. 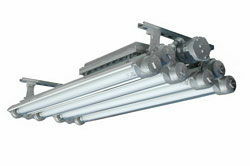 Explosion proof lights like Larson Electronicss’ EPL-48-4L Explosion Proof Fluorescent Lights for Paint Booths provide such protection through precisely this manner. Although it would seem counterintuitive to allow gases to escape at all, the pressure from internal explosions can be such that it would be overly difficult and impractical to design housings capable of withstanding them. By simply forcing the ignited gases to exit very slowly, protection is achieved without excessive cost or design constraints. No matter the size or scope of an enterprise, flammable materials require special considerations if they are to be handled safely. By removing potential sources of ignition, a great deal of the risk associated with working within a hazardous area is thus removed as well. As noted by the Fire Triangle, there must be Fuel, Oxygen and Heat to produce ignition. Remove any one of these, and the triangle collapses.